August 7th, 2009	You might think that black bears are black, and grizzly bears are easily to distinguish by their colour. 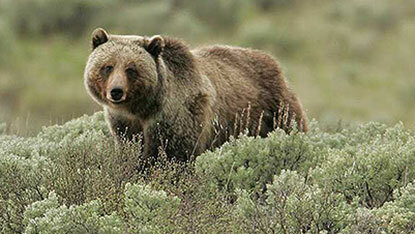 But both bear species in Yellowstone can be black, brown, or even blonde. Another cliche is that black bears are much smaller than grizzlies, but although grizzlies are generally bigger, a big male black bear can easily outweigh a female grizzly or a young grizzly. Without colour or size as a guide, you have to look at other features. The best way to tell grizzlies and black bears apart at a distance is by their body shape. Unlike black bears, grizzlies have a distinct hump on their shoulders that is higher than their rump. Watch this video to learn more. Or read here.